Like all of the Free & Clear products we sell, you'll love what is not in our hair styling gel, because Free & Clear Hair Styling Gel contains no alcohol or any of the other irritating chemicals found in most ordinary hair styling products. Get firm, long lasting control while it helps nourish and repair damaged hair. 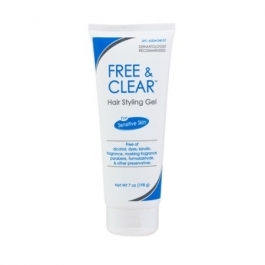 Also Free & Clear Hair Styling Gel helps reduce flakiness and control static while it adds fullness and volume. purified water, VP/VA copolymer, panthenol, PEG-45 palm kernel glycerides, 1,2-hexanediol, PEG-14, acrylates/C10-30 alkyl acrylate crosspolymer, PEG-33, caprylyl glycol, PEG-8 dimethicone, aminomethyl propanol, tetrasodium EDTA.